Having served eight seasons as an assistant coach with Edmonton, Bill Moores brings a vast and wide-ranging coaching knowledge to the Oilers as he has served as a coach at the junior, collegiate, international and professional levels. 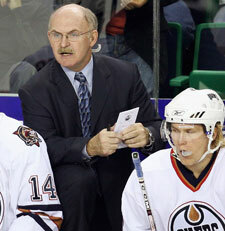 Moores joined the Oilers coaching staff on July 21, 2000, when he signed a three-year contract and then agreed to a second contract in July of 2003. Prior to returning to his hometown, Moores had previously served as an assistant coach with the New York Rangers in 1996-97 and 1997-98. In 1997-98, Moores and Craig MacTavish served as assistant coaches with the Rangers. After playing four seasons of junior hockey with the Edmonton Oil Kings (1966-67 to 1969-70) and a season with the University of Alberta, which saw him lead the Golden Bears in scoring in 1971-72, he coached in the Edmonton Minor Hockey Association for several seasons before returning to his alma mater as an assistant coach to Clare Drake in 1976-77. From 1976-77 to 1993-94 Moores was a member of the Golden Bears coaching staff, serving as an assistant coach for 10 seasons and head coach for seven. He was first named head coach of Alberta in 1979-80 when Clare Drake was with the 1980 Canadian Olympic Team and he also replaced Drake in 1983-84 before assuming the head coaching duties on a full time basis in 1990-91. In his seven seasons as head coach at Alberta, Moores compiled a career record of 220-80-23 (.717) with a Canada West Hockey conference record of 129-44-20 (.720). A four-time Canada West Hockey Coach of the Year (1984, 1990, 1991, 1993) and two-time CIAU Coach of the Year (1980, 1991), Moores led the Golden Bears to five CIAU national championship tournaments, winning the University Cup in 1980 and 1992. His teams won five Canada West conference titles and never finished lower than second place, winning 30-or-more games in five of his seven seasons behind the Alberta bench. In 1985-86, he spent a season as coach and general manager of the Western Hockey League’s Regina Pats, guiding the team to a third place finish in the league’s East Division with a 45-26-1 record. Following the 1993-94 season, Moores took a leave of absence from the University of Alberta to coach in Japan where he served as head coach of the Kokudo Bunnies in 1994-95 and 1995-96. He guided Kokudo to the Japanese Ice Hockey Federation championship in 1995 with a 22-7-1 record and a 3-2 win in the best-of-five final. After his second season in Japan, Moores accepted an assistant coaching position with the Rangers, but his ties to Japan did not end as he served as a consultant to the Japanese National Team and was an assistant with Japan at the 2000 IIHF World Championships in St. Petersburg, Russia. Moores and his wife, Connie reside in Edmonton.